Darlings- meet the creator and owner of The Stylist LA, Emily McDonald. Emily is the creative mind behind a women's clothing rental company for any occasion! We love how she has created a company that has allowed any woman to rent the dress she wants for a night out, attending a wedding, or any other fun or special occasion! Q: Give us your best "15-second" elevator pitch" on who you are and what The Stylist LA is all about! 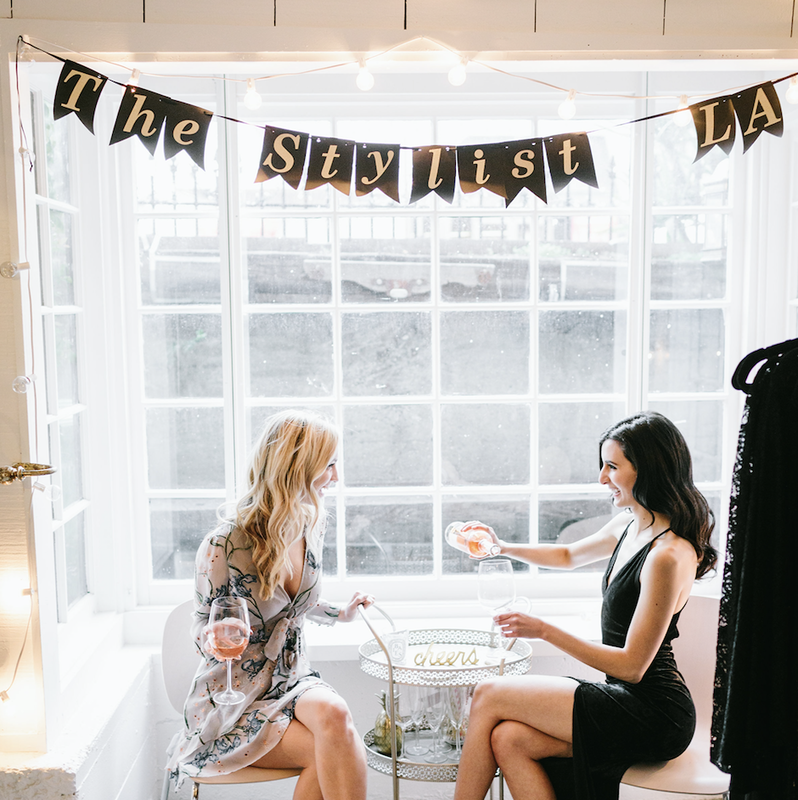 A: The Stylist LA is a women's contemporary clothing rental company based in LA. We have two showrooms in LA & SF and we also ship nationwide. Q: Where did the idea for The Stylist LA come from? A: When I was in college and in a sorority at USC I saw how often girls needed new dresses for events but how reluctant they were to wear the same dress twice or to spend money to buy a new outfit for each event. At the same time I was interning for a fashion PR firm and I saw how celebrities (or really their stylists) basically checked clothes out for them to wear to each of their events. That's when I started to wonder, why can't the every day girl "check out" clothes for each of their events? Q: Your company specializes in rental dresses and outfits for special occasions! How do you pick and choose specific brands to carry on The Stylist LA? A: There are many different ways we pick our brands and the styles that we carry. We attend LA market every quarter where we visit with our brands, see new styles and have the opportunity to check out new brands. We keep a close eye on what our clients are loving, what brands they are following and what they think is missing in our current inventory. And it's funny to say, but instagram is a good way to find new brands these days. We always keep our eyes open to brands and styles that catch our eye! A: Ambiance is everything. One thing I've found from running this company is it's a wonder what simple candles and twinkly lights can do! Things can be kept so simple and still gorgeous. With events and with outfits I always love when a look is effortless. I love when the vibe of an event or the vibe of an outfit is so chic, it seems like the person who created it just threw it on (or threw it together from an event perspective.) I've found that when someone doesn't try TOO hard, it makes for a better event. A: Oh my gosh, yes, a million things. There are so many things you don't know when starting a company, but you can't let that stop you. And yes, I try not to have regrets, but there definitely are things I wish I had done differently. I just have to believe that the choices I have made have gotten me to the point I am now. Also, every mistake has led to incredible learning experiences. It's important to keep that in perspective. I've recently started consulting women who run small companies or those who are about to start companies, so I can try and help them avoid mistakes I have made. You have to pay it forward! A: A group of my fave Boss Babes and I started a goal group which has been really helpful. We email weekly about our goals for the week and we meet at least twice a year to go over big goals. They act as a support system for the ups and downs of running a company. I also joined the Entrepreneur Organization Accelerator program which has been extremely helpful. Through the accelerator you are given the tools to be a better leader and run a successful company. To grow our following we have used everything from apps like Planoly, to strategies like working with girls from the show the Bachelors and other influencers. Q: Ribbon or Glitter? Neutrals or Bright Colors? Long or Short dress? Chocolate or vanilla? Beach or mountains? Going out to dinner or staying in? A: Glitter, neutrals for sure (my whole wardrobe is varying colors of black, grey, tan etc.) Short Dress, Chocolate, Mountains, ohh that's a tough one. Depends on my mood, but I would say going out to dinner.